For week one I encourage you to start simple and begin with your felt sense. You will find a simple Somatic Awareness Exercise below as well as a guided, audio meditation for you to try. These may seem very simple, but I assure you they are powerful tools in our journey to Self Awareness. Our earliest experiences were pre-verbal and somatic, meaning the felt sense of our own bodies and experiences. We didn't have thoughts or concepts or labels yet. We just had sensory stimulus that either felt good, bad or neutral. So by accessing this same awareness now we can begin to touch into some of our most basic experiences, beliefs and feelings. With this process, slower is better. So take your time as you explore these activities. 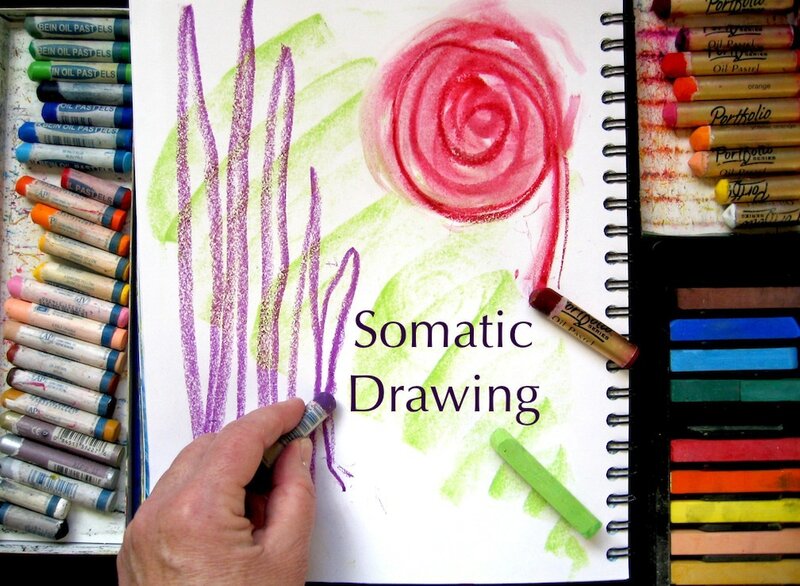 I know these may seem rudimentary for those of you who have been expressing yourselves creatively and artistically for years, but they remain powerful tools that I encourage you to try out, for they will continue to be references as we proceed into more complex processes. When we turn & face inward and look at what is right here and begin to notice the subtle and not-so-subtle ways our bodies are communicating with us, we also see that decades of experience has been stored within us. We may also find that any tension or dis-ease that we are experiencing can be linked to early experiences that have remained repressed in our bodies. Often our attention alone is enough to begin to free up this bound energy & release it through our nervous systems. But by combining somatic awareness with creative expression we have greater access to early causes as well as our innate inner wisdom that understands what we need to grow and thrive and awaken to who we really are. Throughout this experience I encourage you to trust your inner guidance and if anything feels overwhelming, please slow down or stop and either use a grounding/resourcing exercise or seek additional assistance by a trained professional. Begin by closing your eyes and taking a few slow breaths. With each breath allow your mind to settle into your body more and more. Then, with the perspective of a neutral witness, scan your body and notice whatever sensations are present without labeling them good or bad. Simply notice them and if you can, stay present to them using Compassionate Curiosity. More often than not you may find that simply observing and staying with a sensation allows it to shift and change. Sometimes you can even feel some sign of release, like a deep breath, tingling, twitching, pulsing, energy streaming, stomach gurgling. Even burping and farting can all be signs of beneficially releasing held tension.